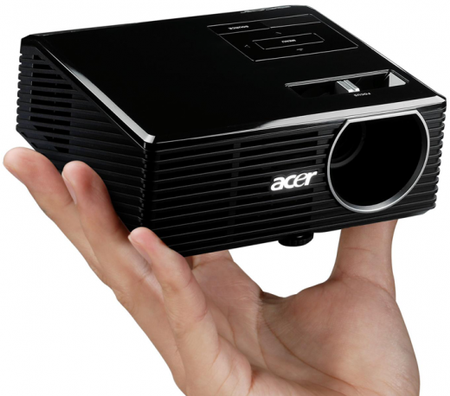 Review Acer’s website describes the K10 as a "travel projector", but we reckon the tiny size and weight of this LED unit qualify it as a Pico Projector. The photos don’t do the K10 justice. Its dimensions are a diminutive 127 x 122 x 52mm tall, including the rubber feet. The weight of the bare projector is 540g, according to our kitchen scales, but you need to add another 630g for the 19V power brick. This is a pain as it takes up the same amount of space as the projector. However Acer has a trick up its corporate sleeve. We are told that the K10 can be powered by the AC adaptor from an Acer laptop. This means you only have to carry one power brick and can give presentations with the laptop on battery, while the K10 runs on mains power. Although the K10 is a DLP projector, the specification is quite unusual. For starters, there is the LED light source, which has a rated life of 20,000 hours. That ought to mean that you'll never need to replace the lamp. 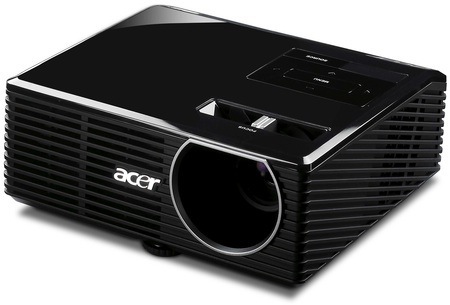 By contrast, an Acer PH530 projector has a rated lamp life of 2000 hours which means that the bulb will deteriorate after a couple of years of regular use and it costs £159 to replace. The downside of the LED light source is a brightness rating of a mere 100 lumens. We're used to projectors having a brightness of at least 1000 lumens, and 2000 or 3000 lumens are quite common. The consequence is that the K10 has a projection distance of 0.6-2.4m and a diagonal picture size of 38-152cm. These figures are one tenth of the ones you get with most projectors, which is logical as the brightness rating is also one tenth of other projectors'.